A profound transition is taking place in our interactions with technology. If the last ten years were about getting all the information you need at your fingertips, the next ten are about making sure that you have the information that’s useful to you right now. Google Now is the search giant’s attempt to figure out what data you need, and deliver it when you need it—and it’s now available to iPhone and iPad users. 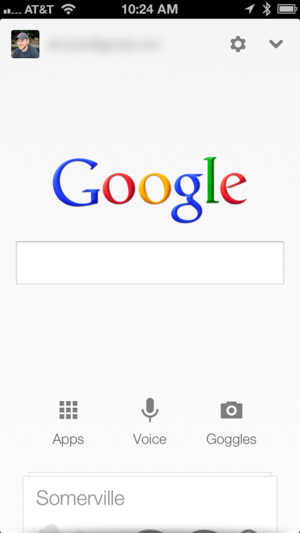 Though it’s been available for a while as a built-in feature of Android, Google Now arrives on iOS as part of the Google Search app. It’s also not a stretch to say that the app’s experience has been largely subsumed by the addition of Google Now; when you launch Google Search after the most recent update, you’re greeted by a video explaining what Google Now is, and encouraged to enable the feature. Unsurprisingly, much of Google Now’s utility is based on integration with your Google account, so you’ll need to log in if you want to take advantage of the new features. Once you do so, you’ll get walked through a tutorial, explaining the features of Google Now and how to use its card-based interface. Google Now is accessible by swiping up from the bottom of the Google Search app—you’ll see the tops of cards just peeking out there. Each card is a widget in and of itself, offering everything from weather to sports scores to traffic information about your commute. None of that is particularly novel: OS X’s Dashboard and Siri already offer that kind of information; what makes Google Now compelling is that it tries to intelligently figure out what information you want when. For example, knowing where you work, it can provide you information on your commute in the morning, or on your way home in the afternoon; when your favorite sports team starts playing, it can pop up a score screen; and when you travel in a foreign country, it can offer you local conversion rates and language translation. 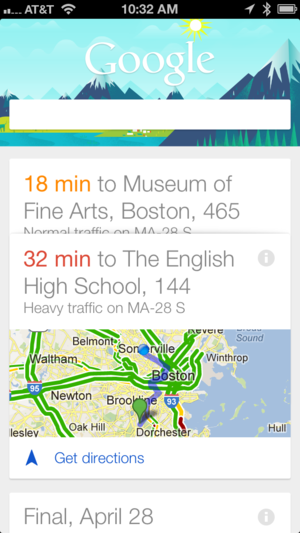 Google Now uses a variety of data to figure out what information is most pertinent at any time. Most obviously, it can use your current location to show you information about nearby places (including restaurants, bars, and movie theaters), other information—flight times, package tracking, events, etc.—can gleaned from your Gmail inbox, if you allow Google Now access to it. If you enable the Web history feature, Google Now can also pull information from your Google searches, even if those searches aren’t done on the same device. I ran a search on my Mac for the traffic between my house and another location, and the next time I opened Google Now, a card told me the current traffic conditions and how long it would take to get there. That said, Google Now didn’t perform perfectly in my admittedly perfunctory tests. Though the app claims it will pop up information on public transit times near bus stops and train stations, I couldn’t get it to display any data when I walked to the bus stop at the top of my street. I hope to give the app a more thorough workout on an upcoming vacation abroad. 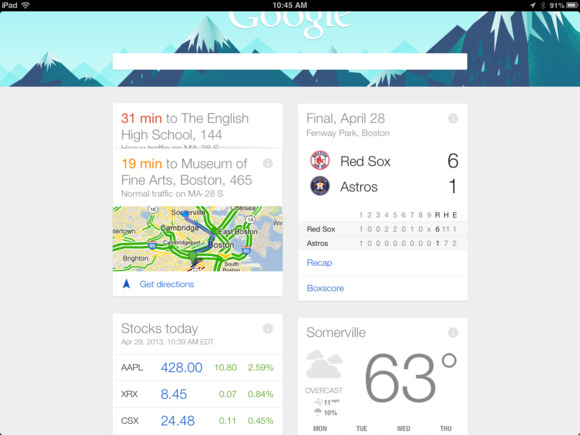 There’s a fair degree of customization available in Google Now, too. While you can disable the feature as a whole, it’s also possible to select certain parts of particular features: For example, as someone who works at home, I can make sure that the commute sections don’t pop up. (That’s particularly useful, since my “work” is technically across the country from my home, which makes for a heck of a trip.) 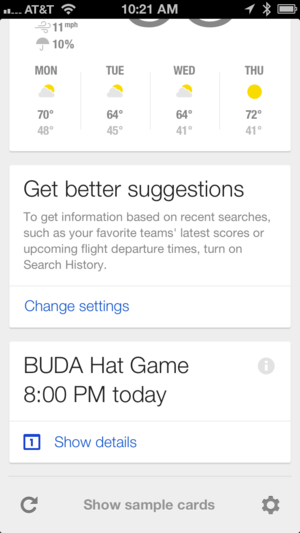 In certain places, you’ll need to actively specify information, for example your favorite sports teams and any stocks you want to follow; in other places, it’s unclear exactly how Google Now gets its information—though an option under Movies lets you have a card appear “For My Favorite Movies,” there’s nowhere to specify which films those might be. Google has already made inroads into iOS, creating its own bubble of an ecosystem inside Apple’s mobile OS, and Google Now only furthers that cause. While the app is limited in how it interacts with iOS itself, due to Apple’s rules about apps running in the background, those who use other Google services extensively will likely find it an attractive proposition. It is a little surprising, however, that Google has not yet built in support for push notifications, to alert users when new or updated cards are available. It’s not hard to see Now as Google’s answer to Siri: Both aim at creating an intelligent assistant that marshals relevant data and presents it to you. But where Siri is really about pulling information when requested, Google Now is about figuring out what information you need without your even having to ask. It’s the difference between a knowledgable concierge and, say, a hyper-competent valet. Though there may be room for both, it’s clear that this is the next battleground for personal technology.